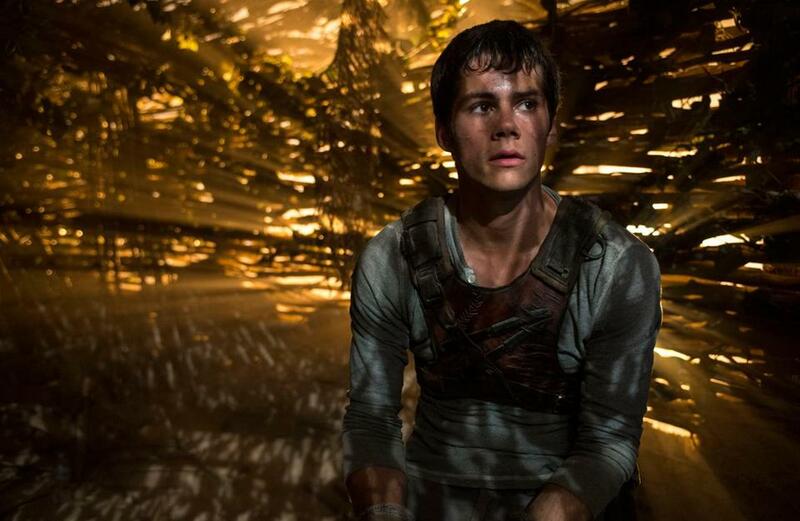 Based on book one of James Dashner’s best-selling series, “The Maze Runner” begins as adolescence does, in confusion. Via an industrial elevator, Thomas (Dylan O’Brien, of “Teen Wolf” fame) suddenly arrives in a secluded meadow filled with boys. This is the Glade: a post-technological playground of hammocks, tree houses, and drumming circles, all kept in line by “Lord of the Flies”-style tribal rule. No girls allowed. This macho summer-camp fantasy would be idyllic were it not for the 100-foot concrete walls surrounding the compound, and the boys being clueless as to how they got there. “Why can’t I remember anything?” asks the emotive O’Brien, perpetually on the edge of weeping. Who am I? Adolescent angst in a nutshell. What these boys-to-men do know is that every morning a massive concrete door slides opens, revealing the Maze. An elite team of Runners, led by Minho (Ki Hong Lee), have been exploring it each day, trying to find a way out. As in any good Dungeons & Dragons labyrinth, here be monsters. The half-spider, half-robot Grievers (and only half-convincing as digital effects) roam the corridors, inflicting deadly stings. Each nightfall, the portal slams shut. Before long, Thomas is exhibiting the pluck to make him a successful Maze Runner. He’s got advocates in leader Alby (Aml Ameen), kindly Newt (Thomas Brodie-Sangster), and chubby kid Chuck (Blake Cooper). But Thomas the “greenie” rouses the suspicions of Gally (Will Poulter), the gang’s muscle. Then comes the Glade’s first ever girl, Teresa (Kaya Scodelario), upsetting the testosterone balance of Boyland. Meanwhile, Thomas is haunted by vague memories of some research facility. “The Maze Runner” will feel familiar to consumers of other young adult-centered, post-apocalyptic fare like “The Hunger Games.” Society is in ruins. Teenagers run amok, wielding crude weapons and testing their nascent power. Director Wes Ball’s adaptation adds a pinch of “Lost” and “Logan’s Run” into the teen-dystopian genre’s hormonal stew. What’s amazing is that newcomer Ball, whose only previous film was the seven-minute CGI animation “Ruin,” was given the reins to this lucrative franchise. Using a refreshingly gentle FX touch, Ball has successfully transposed the decaying, vine-covered concrete jungle look of his short onto this gorgeously-designed feature. The neophyte knows how to direct heart-pumping chase scenes and has coaxed surprisingly solid performances from his young ensemble cast, especially O’Brien and Poulter. A metaphor for our confusing, arbitrary world, the Maze must be solved. Thomas is the angry lab rat tired of navigating a pointless puzzle. “We get out now, or we die trying,” he cries, leading the charge. Teens should eat up this fantasy’s scenery-chewing angst and doom, and the hopeful tale of survival and empowerment (to be continued in the inevitable sequel or sequels). But be warned. The film’s door shuts the way adolescence can, with a brutal wake-up boom. Who created this messed-up place? Adults. You can run, but you’ll still grow up.